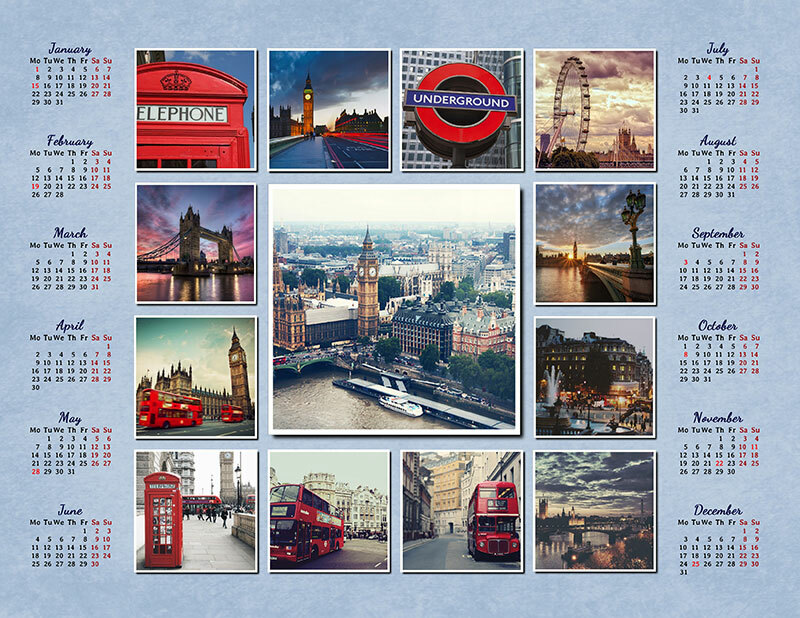 Want to create a collage calendar with your photos? Calendars that you can buy at the store are good for many reasons, but they don't mean anything to you personally. 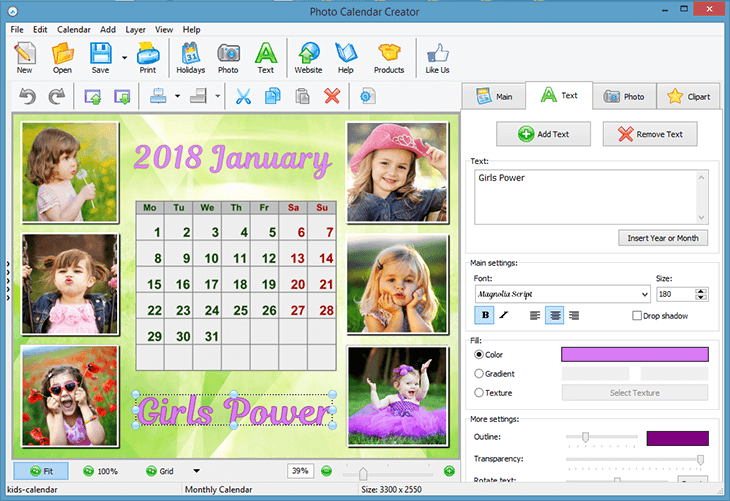 Now you can use Photo Calendar Creator to make a unique photo collage calendar with personal photos or images. You will become the owner of an outstanding collage calendar in just 5-15 minutes. How do you do it? 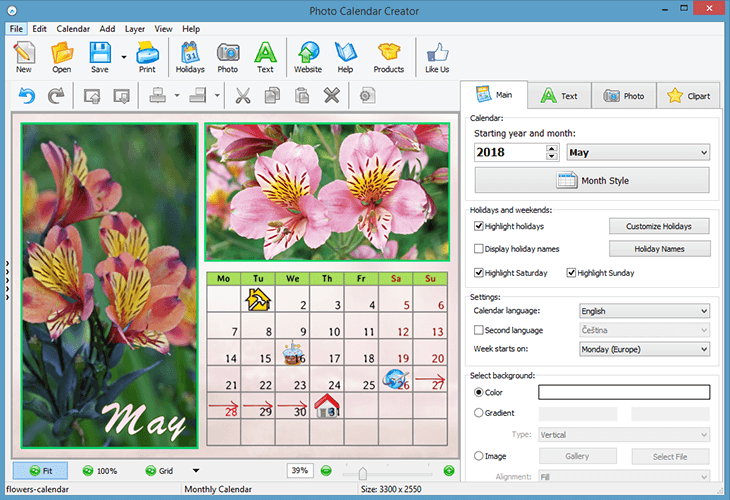 AMS Software has developed a special program that helps create a calendar in any language. 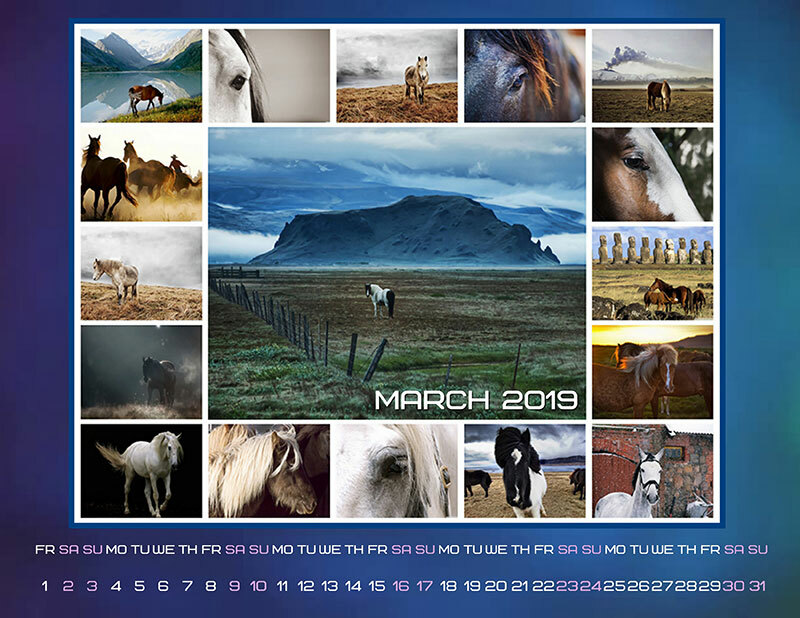 All you need to do is to choose images, and in several minutes you will have a unique photo collage calendar with personalized holidays, events, important notes, and even the moon phases. Choose a theme. Take some photos of your family, vacations, favorite places, or inspiring moments... The best way of selection is through rating. First of all, send everything you liked at first glance into a separate folder. Then choose all the best ones. These images will become the basis of your calendar. Scan printed photos. If you selected prints, you will have to scan them. You will need a scanner and a program that will help you scan the photos in the best resolution. Consider the photo quality. Of course, the quality of your photos matters. But sometimes, the moment you captured is more important than the number of pixels. After all, you aren't making a photo collage calendar for a graphic design contest. 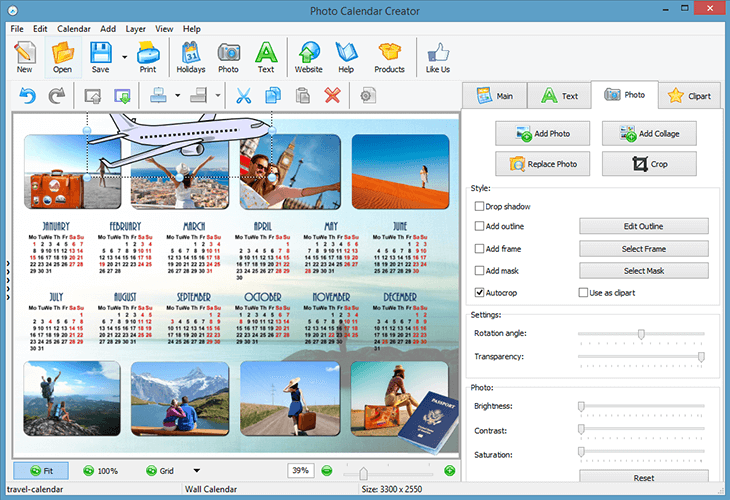 Run Photo Calendar Creator software. Here you can choose the type of your calendar: wall, desktop, pocket, annual, quarterly, or just a planner. After selecting the format, click Next. The next step allows you to choose one of the design options: if there is a main image, it can be inserted right away or later during editing. You will also need to select the resolution and paper size for printing. Set the year and starting month of your calendar. Thanks to this convenient feature, you can make your own planner well after January and still enjoy it for the next twelve months. 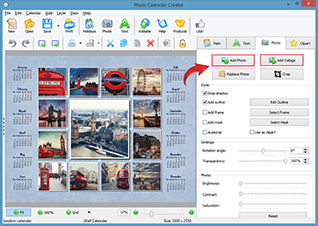 Choose the right size of your calendar page from a number of printing presets. 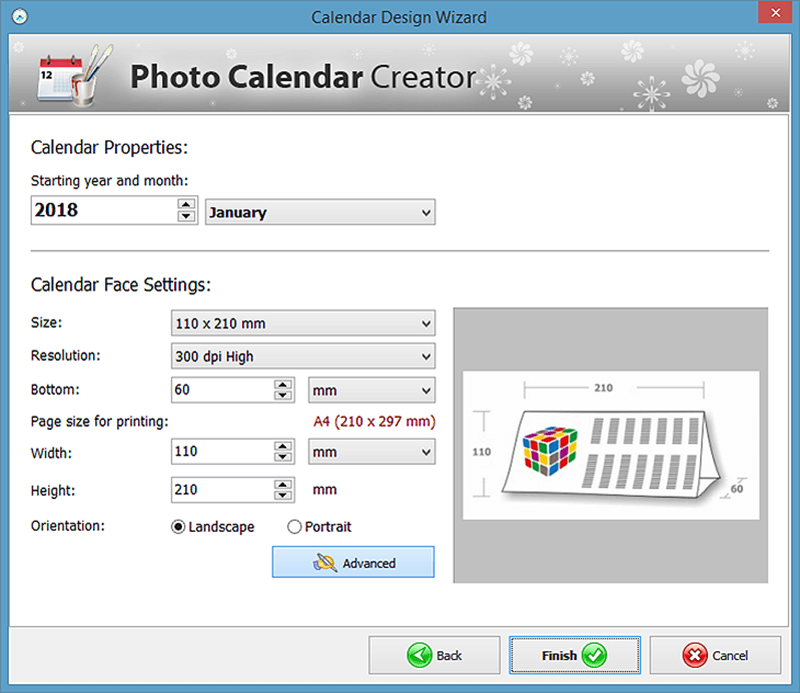 Under the Advanced settings you can set its width and height manually, which is handful if you create a desk calendar. Add Collage is an option to make a collage based on a template. You can easily create a classic grid collage with a suggested number of rows. Add Photo is an option for making a more unique collage with photos of different sizes and different rotation angles, etc. If you decide to use the main photo in your design, then you can edit it anytime just by clicking on it. You can highlight the main image with a white outline or any beautiful and unique frame design. ✎ To use clipart, frames, backgrounds. A finished calendar can be saved in the most popular formats (JPEG, PNG, TIFF, BMP, and PDF) and sent to a local printer. 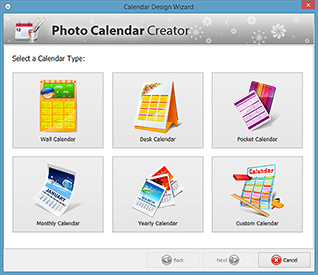 Creating calendars is much easier than you thought if you have convenient software at hand. Have fun with the collage calendar maker!